ESRI might want to reconsider its position……..How about partnering with Yahoo’s or Microsoft’s search services instead, if ESRI is not planning to enter the search market itself? 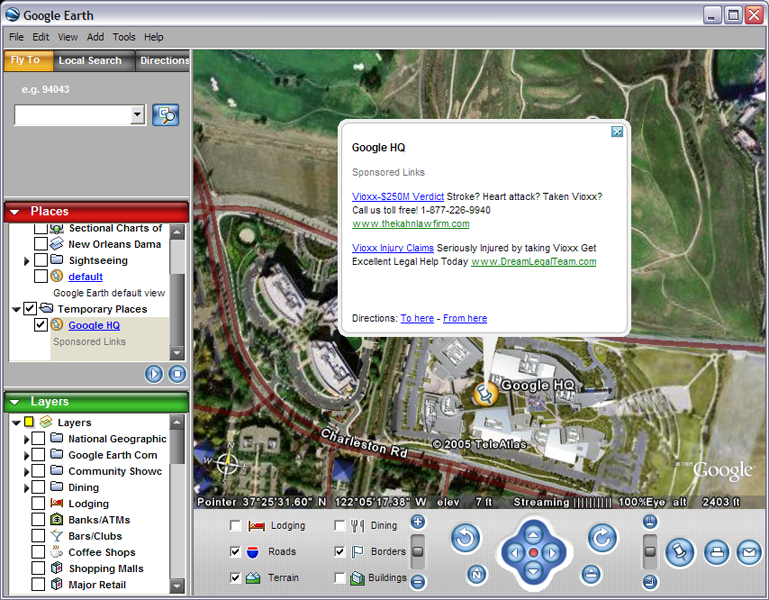 ESRI could thus fund their free version by letting Yahoo or MSN run their ads in ArcGIS Explorer-initiated searches. I don’t get it. Why would anyone want to ad advertisements in a product that doesn’t have them? There is no room for Vioxx ads in professional GIS. I mean, who would want MSN ads in every .NET application you created using Visual Studio? No one of course, unless they are Google fans. I don’t get the logic of selling your soul for the ability to use free Google products (disclaimer: I use GMail so I’m in cahoots with the devil also). Google Earth is all about pushing advertising into a new marketplace and ArcGIS Explorer is about disseminate geospatial information to the masses. That is clear to me now.